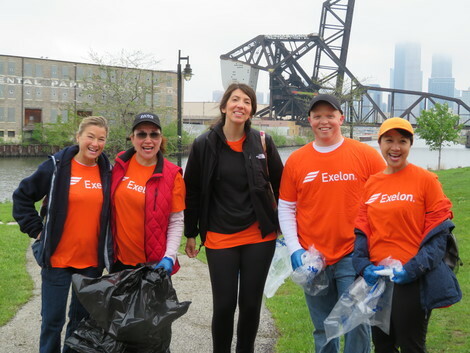 Presenting Sponsor Exelon and employees working together at Ping Tom Memorial Park. To view the 2019 sponsorship information describing sponsorship levels and benefits, click here. Friends of the Chicago River invites you to participate in our 40th anniversary celebrations in 2019 by becoming a sponsor of our most rewarding community-wide volunteer day, Chicago River Day. Volunteers will gather for a day of hands-on environmental work along the Chicago River. Volunteers range in age from pre-schoolers to seniors, represent a wide variety of ethnic and economic backgrounds, and represent school groups, community groups, corporations, and individuals who come from all throughout the 673-square mile Chicago River system. They work side-by-side to collect garbage and sort for recycling, remove invasive vegetation, spruce up river-edge trails, plant native seedlings, and much more. As a Chicago River Day sponsor, your company will have the opportunity for substantial market exposure, employee engagement, and the knowledge that your contribution makes a truly tangible difference throughout our metropolitan region. The event is popular with the press, attracts radio and television coverage, and unique online exposure through websites, blogs, and social media. The images captured from this day of the river and volunteers in action are special. Friends is happy to work with your staff to customize a business sponsorship to fit your needs from activities on the ground to exposure and visibility. Your sponsorship of this major event creates huge ripple effects that allow Friends to continue our work throughout the year on behalf of the Chicago River. To view the 2019 sponsorship information describing sponsorship levels and benefits, click here. If you are interested in learning more, please email Joanne So Young Dill or call 312-939-0490, ext 23.